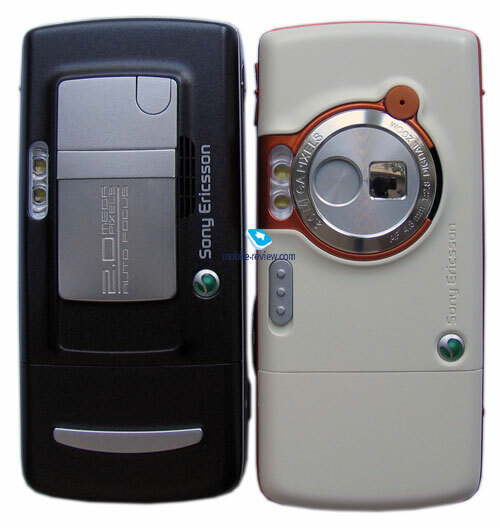 Not every manufacturing company has such two advantages as Sony Ericsson, these are a technical experience and hardware solutions by Ericsson and design and marketing by Sony. This influence of the parent companies was not so obvious and clear till lately. And the launch of the W800 has changed it all at once. 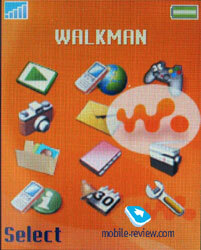 That is the first phone released under the brand of Walkman that became a common name for portable players in some countries. Positioning the phone as a musical solution is quite interesting, several companies has taken this way, but none of them has such a brand and history behind. 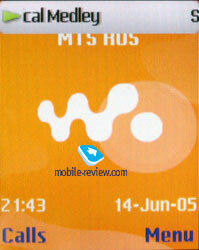 That means one more advantage for Sony Ericsson, and the company will surely use it. 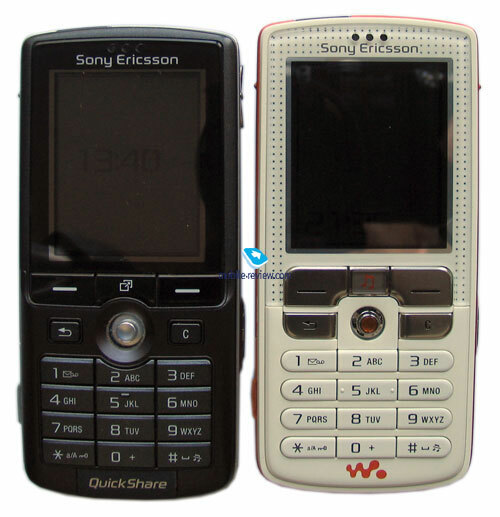 The W index in the phone's name comes from the abbreviation of Walkman, and only two products (Sony Ericsson W800 and W600) are announced for now. The last model will be shipped only to the American market for now and later will appear in Europe. The models are of some certain charm and suit youth audience best. That is a logical attempt to create phones different both from other company solutions and rivals. Having seen this model once you will certainly remember it. A curious fact, the Sony Ericsson label is inscribed on the W800 but not distinguished with paint, that is why it is unnoticeable. Only a small company logo is seen not in every perspective. At the same time Walkman inscription is bright and flashy. That stresses the company appeals to experienced users of musical equipment but not mobile phone users. 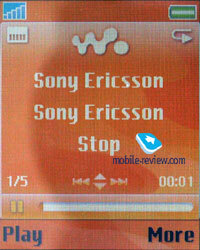 The reasoning is people who know company's phones and needs such a device are more likely to buy Sony Ericsson K750, and new users that constantly listen to the music will respond to the W800's positioning and will choose this model. That means the company issues this device for new users, loyal customers will not buy the W800 actively. 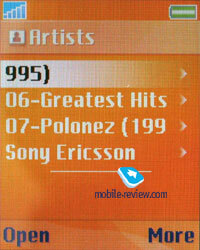 The W800 completely copies Sony Ericsson K750, and we can't write a full review about the device, since there are only three differences. The first difference or design. A vivid orange body with an ivory front panel. The keypad has changed. The buttons are distanced and deeply sunk into the body. The amplitude of the pressures is very low, which makes a feeling of hard pressure. This keypad will suit some people, however it is generally comfortable. The backlighting is also orange and well seen in various conditions. The camera on the back is closed with a shutter having another construction, you only need to slide the toddlers away, and the objective opens. As for the K750 the shutter is big and slides aside. Sometimes during a conversation it may be accidentally opened. A player button is placed under the screen instead of Activity Menu. This seems functionally useless at the presence of a side Music Button. But due to the marketing means it's necessary to stress the main component of the device. The rest of the design coincides. The second difference or standard kit. MS Duo or Duo Pro is the main data carrier in the phone (cards up to 2 GB now, the next year promises 4 GB ones). And if the K750 has a 64MB card included, then the W800 provides a 512MB one. Such a capacity is necessary due to the player use, a 256MB card seems a compromise, and less capacious ones are out of interst. 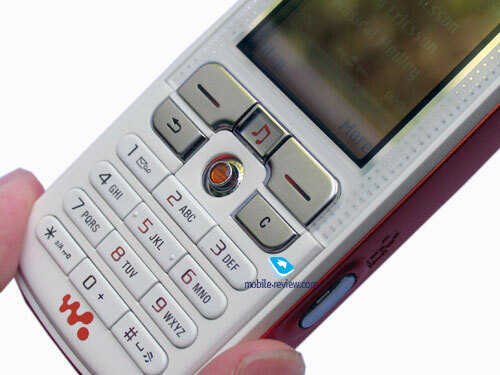 Unlike the K750 the W800's box is a vertical blister showing the phone with earphones. That is typical solution for musical players, the company had no such blister since Ericsson R310s. The kit includes НРМ-70 earphones (a copy of Sony MDR-EX71) which sound better than the ones in the K750's package. The third difference or software. 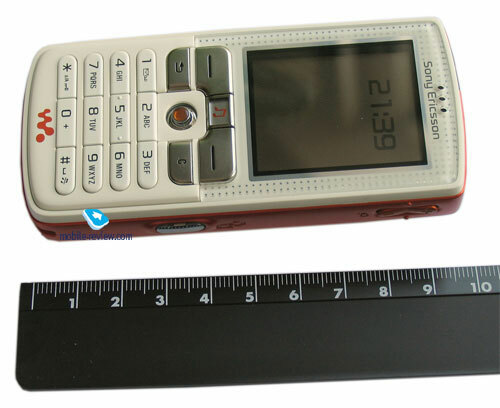 Sony Ericsson W800 is the first company phone (I stress it is a phone but not a smartphone) that can work with a radio component off and even more without a SIM-card. 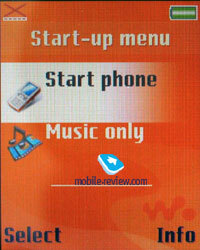 At the start the device will ask you if you want to activate the phone or only the musical player. Having selected only player you will be able to listen to the music not only from the internal phone's memory but from the card also. 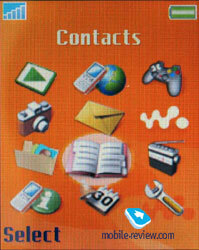 But access to other phone's functions is denied, for instance, games, organizer, and a phone book. That is a pity, but good the majority of the manufactures produce modern phones with an "aboard a plane" profile, that is when a radio component turns off and all other functions are available. This model is a Sony Ericsson's pilot balloon. Another point is you cant' switch to a player mode smoothly, it's necessary to restart the phone. 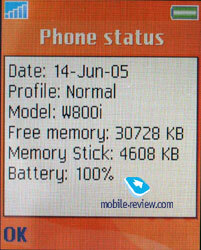 For instance, Sony Ericsson S600 offers another step forward, pre pressing an on/off button you can switch the profile. These two functions are likely to be combined in the next product (that is not just changing a profile but also adding an "aboard" one). The manufacturer claims the increase of the battery life from 15 to 30 hours with a radio component off (only listening to the player, and for the K750 that is 15 hours only. The experiments showed the device really plays twice longer if you do not touch it at all, do not work with playlists (the screen backlighting is off). We had an example that played music with the radio component on for 12 hours and 21 hours with only player function. Working with the player realy shortens battery life due to the backlighting. As for me, the current musical profile organization is not very important and will be useful only aboard planes when all the other functions are useless. In the rest situations turning the radio component off with al the other functions (including radio) seems wrong. So, this function is not a serious improvement as compared with the K750. Other changes concern the appearance of the W sign in the main menu, that signifies a player. The player interface is quite reworked, but still no principal changes, the general comfort of work remained the same. An important difference is the appearance of a status bar on the top of the screen, it shows the title and the performer of the current track. This appears only in the standby mode when you start playing with Music Button, it holds for 3-4 seconds and then disappears. In the standby mode neither a track number nor a song's title are shown. The reason is the developers failed realizing the function fully in time. Let's remember, the K750 shows a bar with volume adjustment on the top of the screen (works even with a player and a radio applications minimized). The W800 shows here a title of the current track at the start of playing. Further this ticker place can be used for various operator's news and so on. That is some kind of a creeping line. A fully-functional realization will be available not earlier than in the next year, and now only slight improvements will appear in every next model, the function will develop gradually. This is the end of all the differences, read a corresponding review to get a clue of a full functionality. And now a couple of words about the W800's price and perspectives. The model will be launched in September with the primary price of 400-480 Euros depending on the country. Now in Europe a functionally similar K750 costs 300-350 Euros. The K750's high price of 500 USD on the Russian market is caused by high stock-jobbing and few shipments. For the launch moment the W800 will cost about 100 Euros more than the current K750's price. The price difference is caused exclusively by the model's newness and the 512MB card in the kit. Considering the fact buying the K750 and a 512MB card will be cheaper than the W800, and then buying the last model seems senseless. Excluding the case when you like the W800's design more than the K750's one. 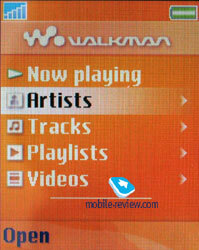 So, the described model is mainly targeted at people little acquainted with Sony Ericsson's products but listening to the music often and having a notion of the Walkman brand. The phones' similarity, earlier launch of the K750 allow suppositions the sales will be low. We think the K750 and the W800 will be sold in the ratio of 80 to 20. 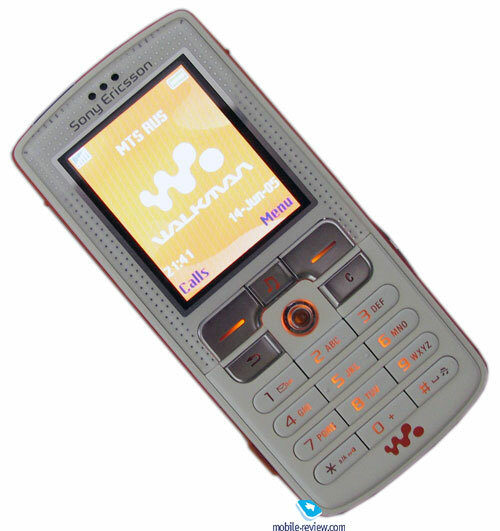 The W800 is the first attempt of using the Walkman brand, and the W600 will be even more interesting, since it has evident difference from its prototype the S600, provides with more internal memory (256Mb against 64 in the S600). Then the company will differentiate the offer much, and no functionally similar models (like the K750 and the W800) will be present.